Stretching from the base of the skull to the esophagus, the pharynx is a funnel-shaped fibromuscular tube. It’s lined throughout with mucous membrane. For both food (deglutition) and air (respiration,) the pharynx functions as a mutual channel. Superior: Base of skull consisting of the posterior part of the body of sphenoid and basilar part of occipital bone in front of pharyngeal tubercle. Inferior: Constant with the esophagus in the level of lower border of cricoid cartilage anteriorly and lower border of C6 vertebra posteriorly. Posterior: Prevertebral fascia in front of cervical spine. The pharynx is divided from prevertebral fascia only by a layer of loose areolar tissue, which enables the pharynx to slip freely on this particular fascia during consuming. Anterior: Opens into nasal cavities, mouth and larynx. Lateral: Neurovascular bundle of neck and styloid process with its connected muscles and ligaments. Nasopharynx, being located behind the nose. Oropharynx, being located behind the oral cavity. Laryngopharynx, being located behind the larynx. Buccopharyngeal fascia (loose areolar sheath). Mucous membrane/mucous layer: The mucous membranelining the pharynx includes a substantial amount ofelastic tissue and is constant with the mucous lining of eustachian tubes, nasal cavities, mouth, larynx and esophagus. It’s lined by non-keratinized stratified squamous epithelium with the exception of in the region of the nasopharynx, where it’s lined by ciliated columnar epithelium (respiratory epithelium). There are lots of subendothelial collections of lymphoid tissue around the commencement of food and air passages, into which epithelium tends to invaginate in the create of narrow clefts (crypts). These collections of lymphoid tissue create pharyngeal and tubal tonsils in the nasopharynx and palatine and lingual tonsils in the oropharynx. Pharyngobasilar fascia: It’s a fibrous thickening of the submucosa. It lines the muscular layer and is thick near the base of the skull but thin and indistinct inferiorly. The pharyngobasilar fascia is thickest: in the upper part where it fills the gap between the upper border of superior constrictor and the base of the skull and posteriorly where it creates the pharyngeal raphe. The outer layer consists of 3 pairs of circular muscles termed constrictors. The inner layer consists of 3 pairs of longitudinal muscles. Buccopharyngeal fascia: It’s an inconspicuous fascia, which covers the outer surface of constrictor muscles. In the upper part, it’s also prolonged forwards to cover the buccinator muscles, for this reason the name buccopharyngeal fascia. Above the upper border of the superior constrictor, it mixes with the pharyngobasilar fascia. Waldeyer’s ring: The aggregations of lymphoid tissue underneath the epithelial lining of pharyngeal wall referred to as tonsils, surround the commencement of air and food passages. These aggregations jointly make up an interrupted circle termed Waldeyer’s ring, which creates the specific attribute of the inside of the pharynx. Pharyngeal tonsil (nasopharyngeal tonsil), postero superiorly. Tubal and palatine tonsils, laterally. It’s believed that, Waldeyer’s ring prevents the invasion of microorganisms from going into the air and food passages and this helps in the defense mechanism of the respiratory and alimentary systems. 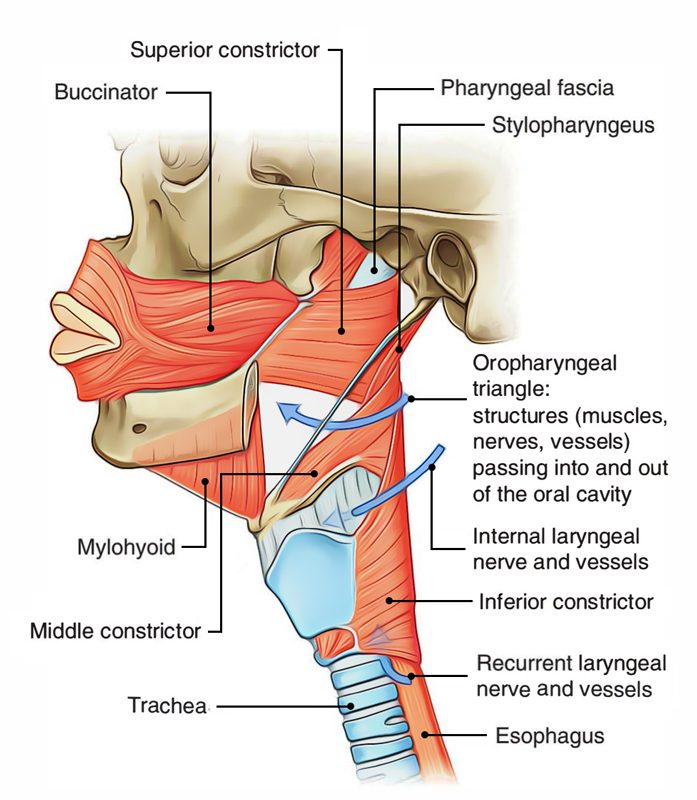 The 3 constrictor muscles of the pharynx (superior, middle and inferior) are ordered like a flowerpot without base, set 1 above the other and open in front for communication together with the nasal, oral and laryngeal cavities. So inferior constrictor overlaps the middle, which in turn overlaps the superior constrictor. The constrictor muscles create majority of the muscular layer of the pharyngeal wall. They originate in front from the margins of posterior openings of the nasal, oral and laryngeal cavities. The fibres pass backwards, in a fan-shaped way into the lateral and posterior walls of the pharynx to be added into the median fibrous raphe on the posterior aspect of the pharynx, going from the base of the skull (pharyngeal tubercle of occipital bone) to the esophagus. Superior constrictor (Quadrilateral in shape) Pterygoid hamulus Pterygomandibular raphe. Medial surface of the mandible at the upper end of mylohyoid line. Pharyngeal Pouch (also referred to as Zenker’s diverticulum). Inferior constrictor muscle has 2 parts: thyropharyngeus created from oblique fibres and cricopharyngeus composed of transverse fibres. The potential gap posteriorly between the thyropharyngeus and cricopharyngeus is referred to as pharyngeal dimple or Killian’s dehiscence. The mucosa and submucosa of the pharynx may bulge via this feeble area to create a pharyngeal pouch or diverticulum. The formation of pharyngeal pouch in the region of Killian’s dehiscence is credited to the neuromuscular incoordination in this region, which might be because the 2 parts of the inferior constrictor have distinct Nerve Supply. The propulsive thyropharyngeus is supplied by the pharyngeal plexus and the sphincteric cricopharyngeus is supplied by the recurrent laryngeal nerve. If the cricopharyngeus doesn’t loosen when the thyropharyngeus contracts, the bolus of food is shoved backwards and tends to generate a diverticulum. These muscles run longitudinally from above downwards to create the longitudinal muscle jacket. They elevate the larynx and shorten the pharynx during swallowing. At exactly the same time palatopharyngeal sphincter created by some fibres of the palatophayngeus muscle shuts the nasopharyngeal isthmus. All the pharyngeal muscles are supplied by the cranial root of accessory nerve (via pharyngeal branch of vagus and pharyngeal plexus), with the exception of the stylopharyngeus that is supplied by the glossopharyngeal nerve. Nasopharynx, by pharyngeal branch of the pterygo-palatine ganglion taking fibres from maxillary division of the trigeminal nerve. Laryngopharynx, by the internal laryngeal nerve. It is located on the posterolateral aspect of the pharynx over the middle constrictor underneath the buccopharyngeal fascia. Pharyngeal branch of the vagus nerve taking fibres from cranial part of the accessory nerve. Pharyngeal branch of the glossopharyngeal nerve. Pharyngeal branch from superior cervical sympathetic ganglion. Ascending pharyngeal artery (from external carotid artery). Ascending palatine and tonsillar artery (from facial artery). Greater palatine and pharyngeal artery (from maxillary artery). Lingual artery (from external carotid artery). The venous blood from pharynx is mainly emptied into pharyngeal venous plexus, which, such as the pharyngeal nerve plexus, is situated on the posterolateral aspect of the pharynx over the middle constrictor. It drains into the internal jugular vein. The lymph from pharynx is drained into the upper and lower deep cervical lymph nodes directly and via retropharyngeal lymph nodes. First phase (in the mouth) voluntary. Second phase (in the pharynx) involuntary. Third phase (in the esophagus) involuntary. In this phase the mouth is closed, the anterior part of tongue is lifted against the hard palate anterior to the bolus of food to shove the masticated food increasingly in the posterior part of the oral cavity. The soft palate closes down onto the rear of the tongue to help create bolus of food. Now the hyoid bone moves up and food is shoved from oral cavity to the oropharynx via oropharyngeal isthmus. This phase is extremely accelerated. The nasopharyngeal isthmus is closed by the elevation of the soft palate and contraction of Passavant’s ridge to stop entrance of food into the nasopharynx. The laryngeal inlet is closed by approximation of the aryepiglottic folds to stop entrance of food into the larynx. Now the pharynx and larynx are elevated behind the hyoid bone by the longitudinal muscles of the pharynx and the bolus of food is shoved down over the posterior surface of the epiglottis by gravity and contraction of superior and middle constrictors. So food enters from the oropharynx to the laryngopharynx. This is followed by quick downward displacement of the larynx and pharynx (by infrahyoid muscles), which reopens the laryngeal orifice. In this phase, propulsive activity of thyropharyngeus followed by relaxation of cricopharyngeus shoves food, which enters from laryngopharynx to the esophagus. From here it enters into the stomach by peristaltic movements in the esophageal wall. All these are potential spaces in regard to pharynx, viz. Retropharyngeal space: It’s situated behind the pharynx and goes from the base of the skull above to the bifurcation of trachea below. 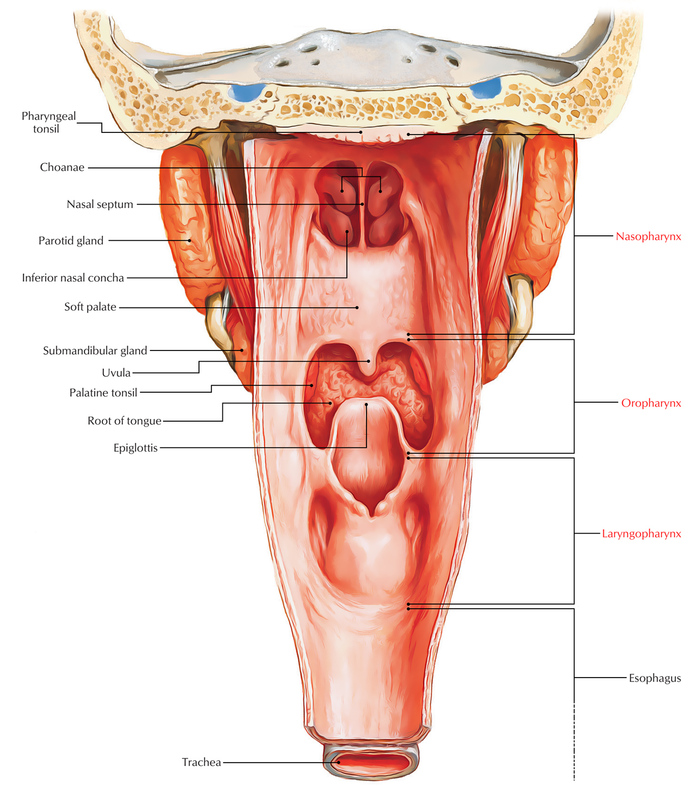 Parapharyngeal space: It’s situated on the side of the pharynx. It includes carotid vessels, internal jugular vein, last 4 cranial nerves and cervical sympathetic chain. There are 2 palatine tonsils (usually named tonsils). Every tonsil is an almond shaped mass of lymphoid tissue situated in the triangular fossa (tonsillar fossa) of the lateral wall of the oropharynx between the anterior and posterior columns of fauces. The anterior column is composed by palatoglossal arch and posterior column is composed by palatopharyngeal arch. The genuine size of tonsil is a lot bigger than it seems on oropharyngeal evaluation because parts of tonsil go upwards into the soft palate, downwards in the base of the tongue and anteriorly underneath the palatoglossal arch. Observe PALATINE TONSILS for details.